Most of us are busy. “Busy” means different things to different people, but by this I mean that a lot of us are operating at full capacity most of the time. Do you ever feel like you’re just spinning your wheels, or is your busyness moving you in a clear direction? Is that direction somewhere you want to go? Did you choose it? Do you know why you want to go there? The other day, I noticed that I felt off. It wasn’t quite sadness, so I wrote in my journal to try and sort it out. I realized that I was feeling a bit lost and disoriented, and it was really uncomfortable. How could I feel lost? I’m very ambitious, I have lots of goals mapped out, and I know the basic steps to accomplishing those goals. I sat with the feeling a little longer and realized something that I’ve never thought of before. Goals are nothing without purpose. I have goals, but that’s not the same as having direction. Goals are what we want to accomplish, but purpose is why we want to accomplish it. I believe we all have a purpose in this life, and that mine is to have joy and share it with others so that they might have joy too. That’s what I try to do with my art and writing. I’m not talking about the joy you feel when you watch a funny movie, but the joy you have to work for and that comes when you know yourself and learn hard lessons and develop a deeper understanding of your own purpose. When we have purpose, we can align ourselves with that and work toward our goals much more efficiently and mindfully. When we forget our purpose, our actions feel empty. Finding your purpose is a deep life question, but I’ve found that with some observation of your actions and desires, your talents and interests, it’s actually fairly simple. I’ll leave that question for you. I’m curious. What are your goals? Are they part of a deeper purpose, or are you still figuring that one out? Sometimes when I feel like I’m moving too fast or running on autopilot, I like to stop and get back on track. One of my favorite ways to reawaken myself to my own life and purpose is to get out my journal and write about what I would do that day if I didn’t have to do anything. I might also write about my ideal day, or maybe just list 20 or so things that I love to do and remind myself to build my life around those. A lot of people think they’d lay around and watch TV all day if they didn’t have to do anything, and that may be true, but everyone is passionate about something. People need to actually do things to be happy. If you don’t know what you like to do, you might want to start there. My day usually involves reading, writing, making art, taking walks, and spending time with my husband. Pretty simple. Some days I feel like going on an adventure and some days I’d rather curl up with a blanket and a Tracy Chevalier novel. Still, playing this little game helps me reassess what I’m doing and whether it’s getting me where I need to go. We should enjoy our lives. It’s not all fun and games; we all have things that need to get done that we’d rather not do, but the bulk of our lives should be enjoyable. Find out what you love most and build your life around that. Use your “ideal day” writing as a compass. Today, if I didn’t have to go to work, I’d go for a walk, work on some new paintings, prepare two of my paintings for an upcoming juried show, read a little, write in my journal, and go for a walk in the evening. Maybe a picnic with my husband. That’s actually what I’m planning to do today, more or less, just with my regular workday in the middle. What would you do today, or on your ideal day? What do you love to do more than anything? Every year around this time, everyone with roots in Utah will notice that his or her Facebook page is full of photos of people covered in colored dust and having a great time. My good friends Destinee and Kyle, all colorful. I went with some friends who are seasoned festival attendees. 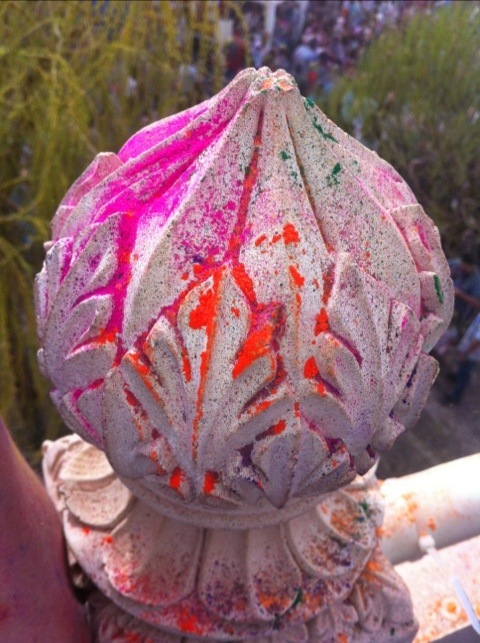 That was the first time I’d actually been to that temple, and it was beautiful, especially speckled with bright colors. The temple was surrounded with peacocks and lamas and these little yak-like things called zebos. 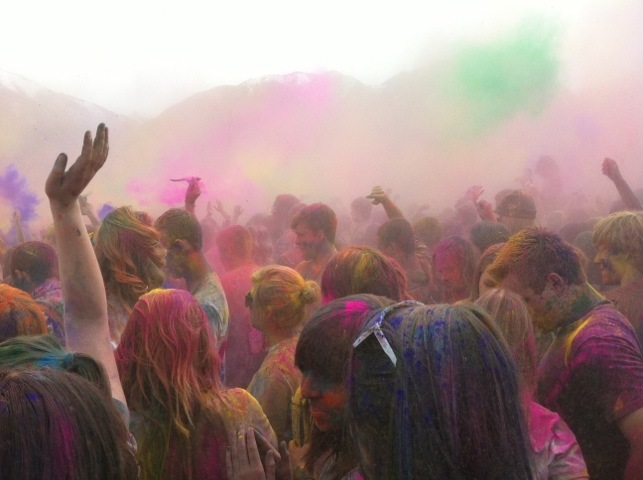 As soon as I stepped in the gates, somebody pelted me with bright yellow cornstarch. I bought three bags of neon-bright powder in hot pink, green, and a very vibrant purple. 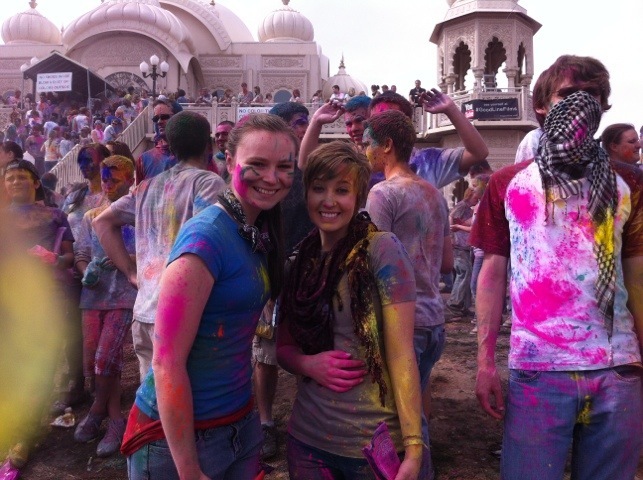 People showered us with their colors at us and we returned the favor. I got very colorful very quickly. I loved going on top of the temple and watching the crowd from above. Several Kirtan bands performed and the whole crowd rippled and pulsed while bright clouds rose up. I love Kirtan, but I’d never heard it live. Granted, this was spruced up a little-much more danceable than traditional Kirtan. I’ve never been comfortable dancing in public, or at all, but I did my signature “can’t dance” dance and had a great time. 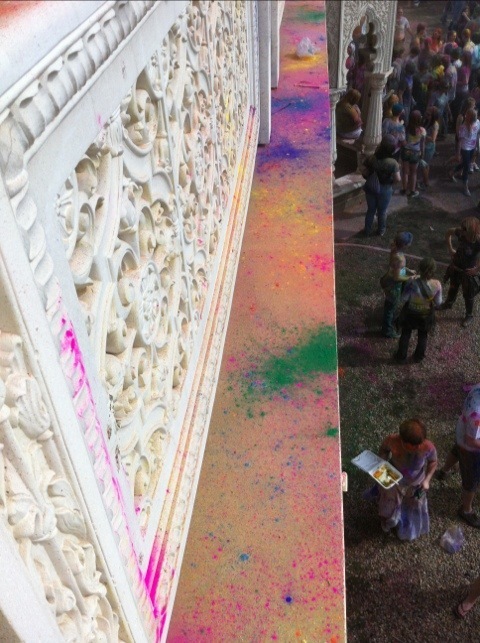 People walked by and hugged me or sprinkled color over my hair. Everyone was friends with everyone. The highlight of the festival is the “throwing”, when the entire crowd throws their colors into the air at once, which creates this beautiful, massive rainbow cloud that blocked out the sun for about thirty seconds and smells amazing. I got all kinds of ideas for colorful paintings. I didn’t see myself until the end, but I looked pretty funny. Somehow my friends managed to stay colorful-as in, you could actually see the different colors- while I was so colorful that I’d turned completely brown! I was smiling the whole time, so the color settled into the creases and contours of my face, so I came out looking like an old lady who’d rolled in the mud. I’m sure I’ll be cleaning purple cornstarch out of my ears for weeks, but I haven’t had so much fun in a long time. I’m going every year. If you live anywhere near Utah and can make it to the festival, I highly urge you to go. I can’t think of a more beautiful way to welcome spring. Taking pictures was kind of hard, but I managed to glean a few decent ones from the dozens of lousy ones I got. My camera cord is permanently pink now. For a much better idea of the festival, go to the Krishna Temple site and watch the video here. Yes, lots got in my mouth. That was the only part I didn't like. The thing I loved most about the festival was the joy. I could feel it in the air; it was a very happy place. I didn’t see any grumpy people. All kinds of people were there, from babies to the elderly. 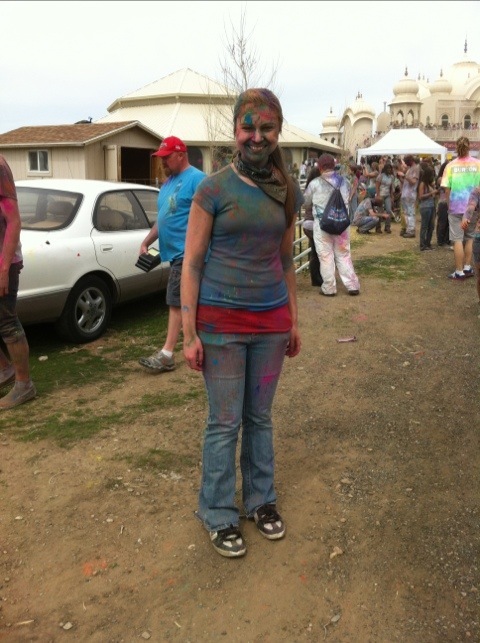 A little girl asked me for a hug so she could get color all over me. I didn’t even mind getting smashed into people during the throwing, because everyone felt like my friend. I don’t recall ever feeling like that toward strangers, but I think that’s what will keep my going back every year. That and the colors. Oh, the colors. 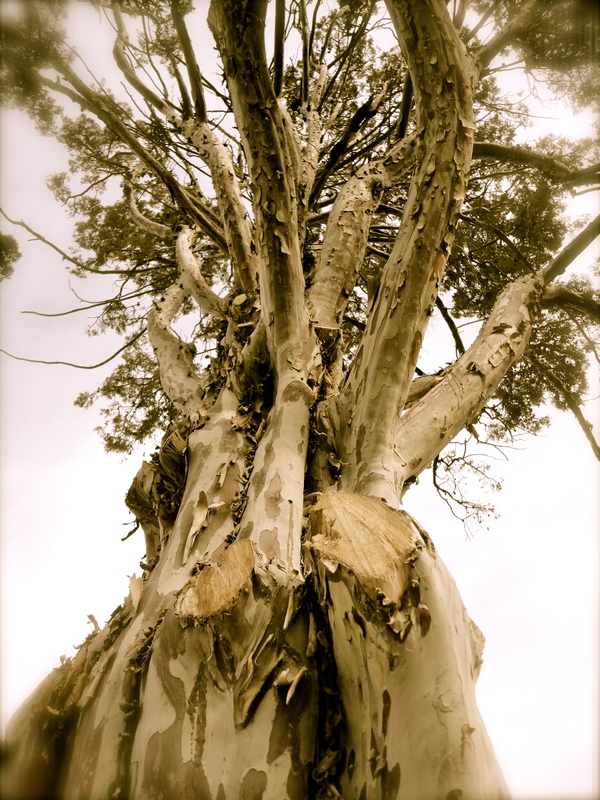 Nature never fails to inspire and encourage me. 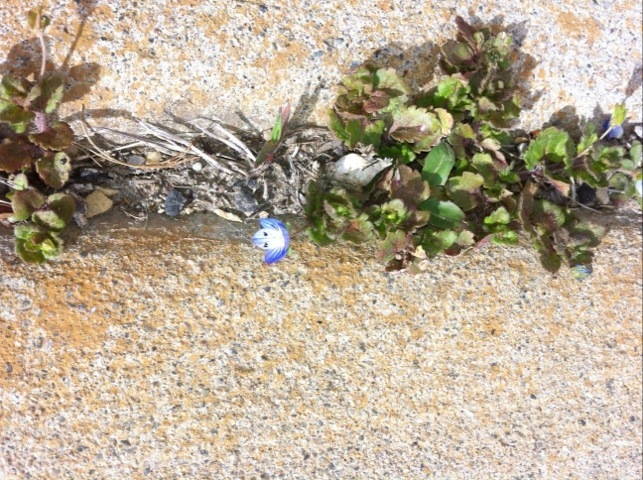 While out on a run/walk/stop and pet cats the other day, I noticed tiny little flowers growing through the cracks on the sidewalk. The wisdom and perfection of nature astounds me. 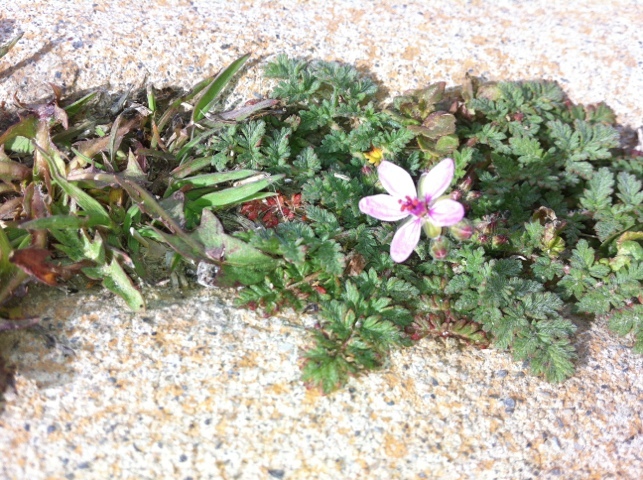 Even when faced with a seemingly huge obstacle (like a slab of concrete) these flowers still found a way to grow and blossom into what they were always meant to become. I think we can take a lesson from that. All of us, at some point in our lives, become ghosts. This doesn’t necessarily mean that we die, but we forget to be present. We might live in the past or the future, or another world entirely. We move through our lives like ghosts; there, but not really there. We might watch but not participate. Maybe we go through the motions, but our minds are somewhere else or even worse, numb. This painting is a reminder to be present. The ghost girl is there, but not really there. She is not reflected in the water like everything else. She gazes up at the moon, but seems to ignore everything else around her. 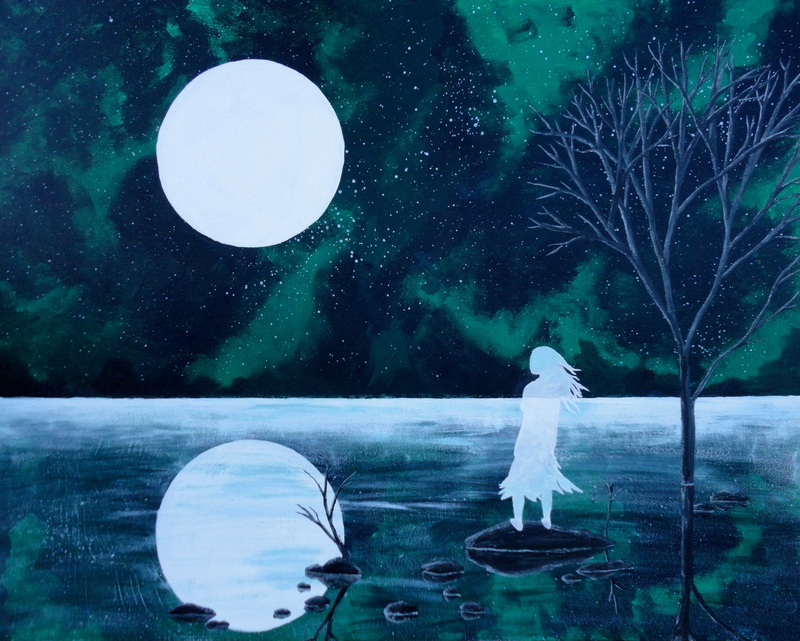 I actually painted this canvas green and black in October, but the original idea I had for it fizzled out. I’m glad I let the canvas sit for awhile. I had other ideas for it, but none of them stuck until this one. I’m glad; this one feels special to me. 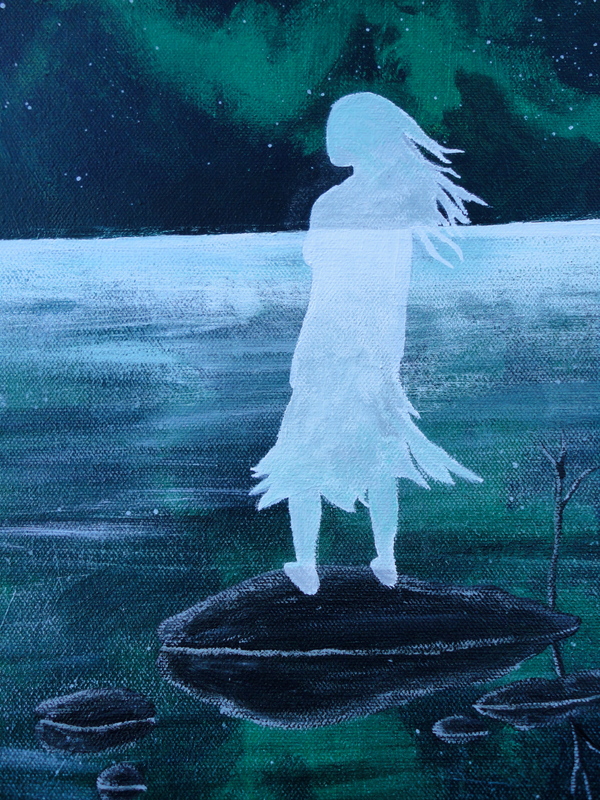 I also painted this because I decided that I believe in ghosts. Don’t worry, I didn’t have a scary experience or anything, it’s just one of those things that clicked for me; it finally made sense. This piece is available for purchase here. I made it through another one. Winter and I have never been on very good terms, but it feels like the last several years have been much worse. Even though I see this as a valuable challenge in my life that will ultimately help me grow stronger, I still hate winter. I hate feeling like crap in the winter. When I think of winter, I also think of lots of swear words, but I won’t write them here. Each spring feels like a lungful of fresh air after I feel like I’ve been half-smothered for the past few months. I can’t tell you how amazing I feel when I first smell that special springy smell for the first time each year. It feels like hope, a fresh start. I feel like laughing and crying and rolling around in the grass like a maniac though the grass is still brown and there’s usually still some snow on the ground at this point. I’m not naive enough to think that it will be all sunshine from here on out. I live in Utah, which is known for schizo weather. We might get snow, rainstorms, a tornado, who knows. It’s spring though, and that’s good enough for me. I tend to go numb in the winter, so when spring rolls around I find it helpful to take a fresh look at my life and take stock, sort of like surveying the damage after a flood. I’ve slipped back into some habits that don’t serve me like stressing out over trifles, some emotional eating, and not eating enough veggies. I’ve put on about 10 pounds this winter due to aforementioned emotional eating. I’m not upset or anything, but I don’t think my body likes it much. I know that it will fall right off when I get my head back in a good place. It always does. At least my pants aren’t too big anymore. My creativity lagged a little for awhile, mostly around the time I went back to work full time, but I feel like things are flowing again. I’ve had time to think long and hard about my goals and priorities and I feel like I’m on the right path. I’m learning to balance goals with living in the moment, which is a rough lesson for me. I’m better at living in the past or future rather than the present, but here is all we have. It’s a beautiful skill. I’m experiencing some food sensitivities and blood sugar issues again, which is a reminder to let food fade into the background rather than relying on it as a prime source of excitement or strength in my life. I get to start all over on what little tan I managed to get last year. A tan for me, by the way, means that I don’t blend into the white walls in my apartment. Time to get my pasty bod back out in the sun! Though my tone is quite snarky and slightly dry today, I actually feel extremely hopeful right now. I’m noticing that people around me seem to be perking up too. People seem to smile more, they have more energy. Spring is good for us. Spring cleaning is always something I’ve enjoyed because I love to clear out the old stuff and feel fresh. I haven’t really made plans for spring cleaning yet, but I’ll be sure to do that soon. Now I’m doing what I need to do to find those stale mindsets that keep me stuck, question them, and then let them go. I think I should make this my new yearly ritual. How about you? Do you do spring cleaning? Do you have any old junk to clear out for your Spiritual Spring Cleaning? A lot of us aren’t happy with where we are in our lives at the moment. We aren’t satisfied with what we’re doing or where we happen to be or what we are. We here so often that we need to accept ourselves as we are and where we are. Most of us fight this notion. I sure do. I reread Women, Food, and God by Geneen Roth last week (one big long string of Aha! moments. Read it.) and she mentioned that accepting is not the same as resigning yourself to a situation. It doesn’t mean that you give up and tell yourself that things will never change, or even worse, that you can’t change things. I think most of us think that acceptance involves giving up, so no wonder we resist it! Accepting is acknowledging where you are and realizing that it’s ok for now. You may still want to change, especially if you don’t like your current situation. By all means, work hard to change if that’s what you really want, just don’t beat yourself up for where you are. Acceptance is a change of attitude, that’s all. It’s not quitting. It took me awhile to let this sink in, but I realized that it’s something that I’ve always known on some level. I’ve never created significant change in my life until I accepted where I was first.I had to love myself the way I was and realize that I had to be where I was, because that’s where I happened to be. That situation had something to teach me. I accepted that knowledge, but I still wanted to change. Change happened pretty spontaneously after that. Whenever I my situation and struggled against it, I got even more stuck. It’s like struggling when you’re sinking in quicksand (the movies always say that’s a bad idea) and sinking even faster. What do you want to change in your life? What do you need to accept? I accept that I need to have a job right now when I’d rather be a full-time artist and writer. Luckily, I enjoy my job, but I’d still rather do my own thing. It’s ok though. This job takes care of me, and I’m glad to have it. I’ll still work toward my goal, but I’m happy with what I’m doing right now. I accept that I don’t have the money to travel the world right now, but obviously, world travel isn’t what I need at the moment or I’d have it. I can love my life anyway. I’d still like to travel and I’ll work toward that goal, but I won’t snub the joys of home. I accept that I have about 10 extra pounds of “winter coat” around my hips and thighs. This is a little heavier than what I’m comfortable with, but it’s ok for now. I’ll still love and take care of my body and I’ll trust it to even things out on its own. I accept that it’s still winter even though I’d really like it to be spring. We’ve had a lovely springy week and now there’s about six inches of snow on the ground and temperatures have dropped. I’ll take whatever moisture we can get for a nice green summer, and I’ll embrace a few more weeks of layers and hot soup. I’ll accept these things, but I also expect change. I think the distinction here is simply attitude, because forcing change does not work. One cannot reach their natural weight by hating his or her body now. One can’t create a thriving career by refusing to acknowledge the starting point, where she is now. How about you? What are you accepting right now? What does acceptance mean to you? Over this winter, I’ve fallen back into a bad habit that I’ve been trying to kick for years. Stressing out over little things. Everything feels like an emergency to me. Part of this may have to do with tired adrenals, which I suspect I’m experiencing, but I believe that 90% of our health starts in our minds. If anything is wrong with my body right now, it started in my head. I mentioned earlier this week that I’ve been holding a lot of tension in my shoulders, neck, and face lately. I’ve also noticed that I’ve been doing things like I’m in a race. You should see me wash dishes. I move quickly, my heart rate seems to be elevated more often than not, my thoughts fly around my head like a swarm of bees, and sometimes I feel powerless to stop it. Then I remind myself that the first step to change is noticing. I know plenty of people who run on full throttle all day long and never realize it. Sometimes I compare myself to them and feel bad because they seem so much stronger than me, but I’m glad that I can notice what is going on and why it doesn’t serve me. Stress wears me out. When I notice that feeling, I can go into it and find out why it’s there. I can ask myself why I feel that way. 9 times of out of 10, its’ something that really isn’t a big deal. I’m getting better at reining myself back in a few times a day. It takes practice, but it’s getting easier. How do you handle stress? Do you stay calm or do you tend to be a stress case like me? Do you notice before it runs you into the ground? This week, I’ve noticed that I’ve been doing things very quickly and that I’ve been holding a lot of tension in my body, especially my shoulders and face. Sometimes at work I’ll notice that my shoulders are burning or that my cheeks hurt. I know myself well enough to know that this means that I’ve been doing too much white-knuckling. I’ve been charging through things without paying attention to now. Sometimes I need to remind myself to unclench my jaw, take some deep breathes, and come back into the moment. I think we all need that reminder sometimes, so today as you go about your business, remember to be in your body. Notice something around you. Release the tension that we all tend to hoard in our bodies. No matter what’s going on for us, remember that there’s still the sky. Birds are still flying around. The world is still turning. Even if we’re drowning in a giant puddle of stress, Spring is still coming. Flowers still bloom. It’s just a little blip on the radar. In other new, Megan from Make Something Mondays has given me the Kreativ Blogger Award. Thanks Megan! Most of my favorite movies and TV shows are technically for kids, but I love them anyway. I love Coraline, Milo and Otis, anything to do with Pixar, Disney movies, and Jim Henson everything. I love food and I have very adventurous tastes. When I went to China, I was always the first to try the chicken feet/sea cucumber/green eggs/fish dishes. Sushi and calamari are some of my favorite foods. I’m not afraid of snakes, spiders, or heights, but I’m terrified of walking on a frozen lake. No ice fishing for me. I’m also scared of centipedes and I hate “rocket” rides at theme parks. The ones that shoot you up and then drop you? Nope. I was 10lbs, 2oz when I was born. I love you Mom. I met my husband in high school when I fell down the stairs and dislocated my left shoulder. His friends rescued me, and after that, I was kind of a part of the group. I made really good friends with both him and his then girlfriend, so I was usually the third wheel. We got married five years later. I have a very dry, irreverent sense of humor that I get from my dad. I like to joke about things like death and pain, because why not? Even if it’s not funny, joking about it makes it easier to accept as parts of life. Now I get to pick 7 other bloggers to stick in the hot seat! Go say hi to them! Michelle from The Creative Healing Studio. Mandee from Life is Wonderful and Full of Delicious Possibilities. Also, check her out on Three Thousand Words. Change happens when you understand what you want to change so deeply that there is no reason to do anything but act in your own best interest.